Posted on 02/15/2018 by Mickey McCarter	in Live Review and tagged Australia, Baltimore, Creative Alliance, Creative Alliance at The Patterson, folk, George Xylouris, Greece, Guy Picciotto, jazz, Jim White, post-rock, Xylouris White. 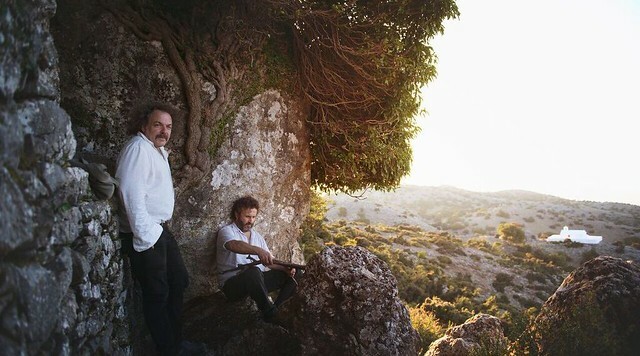 Greek singer and lute player George Xylouris and Australian drummer Jim White together are known as Xylouris White, and the duo released their third album, Mother, on Jan. 19 via Bella Union. The duo will soon tour the United States with a date in Baltimore at the Creative Alliance at The Patterson on Thursday, March 1. Interestingly, Xylouris White have a local connection as all three of their albums have been produced by Guy Picciotto, guitarist and vocalist for Fugazi. George Xylouris says the new album follows a chain of logic from the band’s first two records. “Mother is the extension of Goats and Black Peak. Three things, all part of a whole. Goats are mothers, Zeus was raised on Amaltheia’s milk, Black Peak is Mother Earth… Mother Earth is the mother of everything,” George said. George, now based in New York, is the son of legendary singer and lyra player Psarantonis. He’s brought the power of his lute to collaborations with Bonnie ‘Prince’ Billy, PJ Harvey, Cat Power, and Smog in recent times. He most recently appeared on Kurt Vile and Courtney Barnett’s album Lotta Sea Lice. Jim White is also known as a member of Australia’s Dirty Three.